Our section covers the area of Shrewsbury, the Welsh Marches and east towards Staffordshire. We meet on the last Thursday of the month at 8.00 pm at the Corbet Arms, Church Road, Uffington, Shrewsbury, SY4 4SN. Our new section leader is John Burgess who took on the position last year (2016) when long-serving leader David Flye stepped down. For information on our future plans please contact John on 01270 211126 or e-mail burgessrepairservices@gmail.com. Our big annual events are The Derwen Tea Rooms Run (April), Wing and a Prayer Sleap Airfield Run (May) and Carding Mill Valley Run (June). All now completed for 2017! We will have an NACC stand at the Borders Classic Motorcycle Show at Cleobury Mortimer over the weekend of 9th-10th September 2017. The Buzz’ards “Wing & A Prayer” Run to Sleap Airfield is one of our annual events; this report by David Eyre was published in the August 2015 issue of Buzzing. 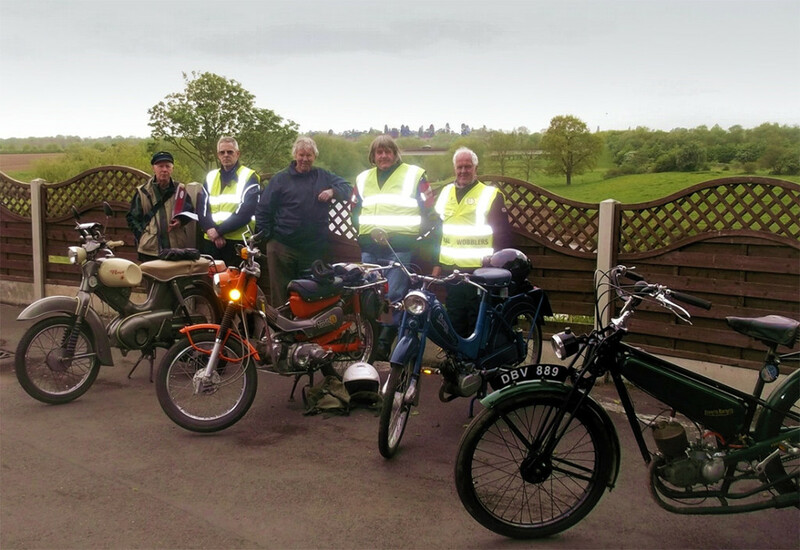 A predictable group of riders were signed on and waved off by Section Leader David Flye together with Bob Parry, with cheery predictions of good weather in spite of the forecast and the somewhat cool experience of previous years. At 4.2 miles we found a clear need for a new route sheet symbol, because the current ones are not representative of our exploratory forays down all available roads. Eventually the steering committee (Ken) decided that the route sheet was right and our collective memory was wrong, and we made good progress to the preferred (and previously nitrogen deficient) hedgerow at Moreton Corbet Castle (NT) where four NACC members were given odd looks by people in short trousers. The second leg was without incident other than John discovering that his machine was fitted with the Francis-Barnett Self-Closing Petrol Tap, an early safety device that prevents muscle cramp and fatigue by encouraging the rider to stop for a short break periodically. The approach to Sleap Aerodrome was marked the sudden loud exhaust sounds – the immediate assumption of a broken silencer was proved wrong when a yellow Piper Cub passed overhead (between us?) doing things that can only be described as ‘not in the user manual’. When we arrived, the car park was full: Shropshire Aero Club were hosting a 2 day aerobatic competition with a good number of spectators. Fortunately there was a barbecue for SAC members so the café in the control tower was under less pressure than we feared, and was able to feed us. The usual Salad vs. Chips debate was abandoned in favour of speculation regarding the meaning of aircraft registrations: MUKY we understood in spite of the spelling, but surely OGGY is some sort of pasty? Eventually our thoughts turned to other things, and a visit to the WARG museum was deferred in favour of eating cake (thanks Ian) to the point where the café ran out of carrot cake.